Built-in Smear Reduction Projector for Simulation Professionals! 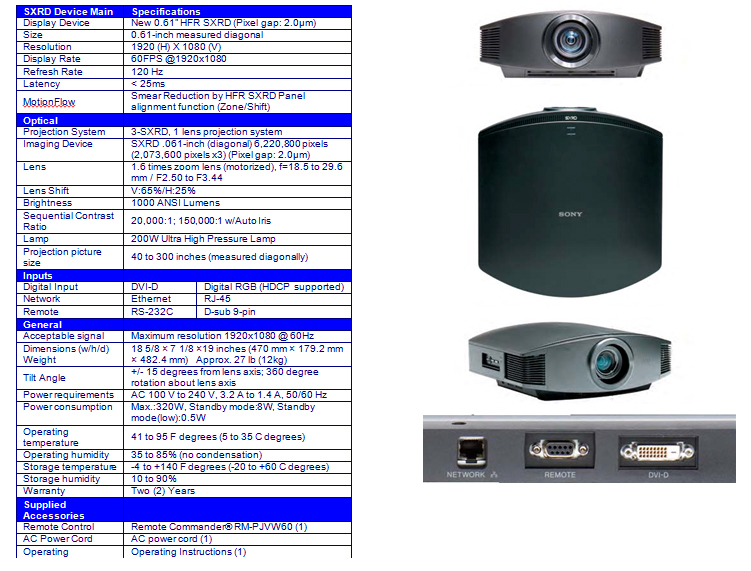 Sony's latest SXRD projector for professional applications, the VPL-GH10, is designed to meet the specific needs of the training/simulation market. Built-in smear reduction capability with Sony’s Motionflowâ„¢ technology makes it simple to enhance the realism of the projected imagery while taking into account the required brightness for each scenario. The extremely high resolution All Range Crisp Focus lens is specifically engineered to optimize the high performance of the Full HD SXRD panel. The on-board DVI interface mates directly to professional image generators and provides a positive connection with available screw connections. This COTS* product includes a significantly enhanced command set available through the industry standard Ethernet network port.